Be still my chocolate loving heart, a moist chocolate cake made from scratch with only three tablespoons of oil in the entire cake! 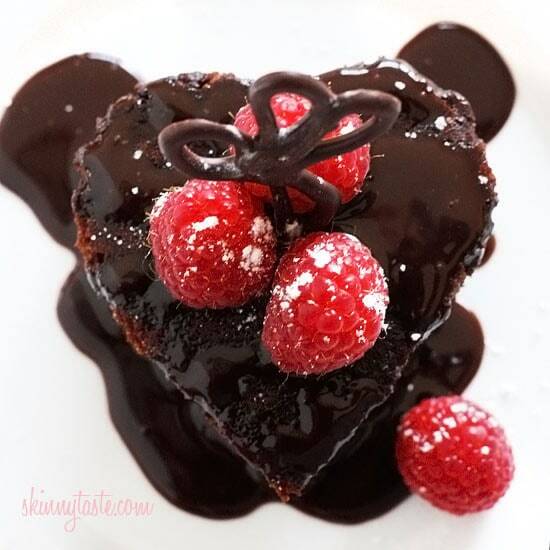 Top this with some chocolate syrup and fresh raspberries and oh my, what a chocolate dessert! I’ve been experimenting making a cake from scratch with less fat for a few days now and after a few rounds I finally got it to where my taste testers (aka husband and friends) all thought it was great and couldn’t believe it was light. My secret? There’s pudding, yogurt and applesauce in the mix! This recipe was created for those of you who like to make their cakes from scratch, but if you prefer a quicker method by using a box cake mix as an ingredient, see my Super Moist Low Fat Chocolate Cupcake recipe. This cake rises beautifully and the coffee brings out the flavor of the chocolate. Will it work without the pudding? Yes, however the texture will change and you’ll need to increase the sugar. Can you use less oil? Yes, but I’ve already cut out more than half, and using less will work, but the texture will be drier. 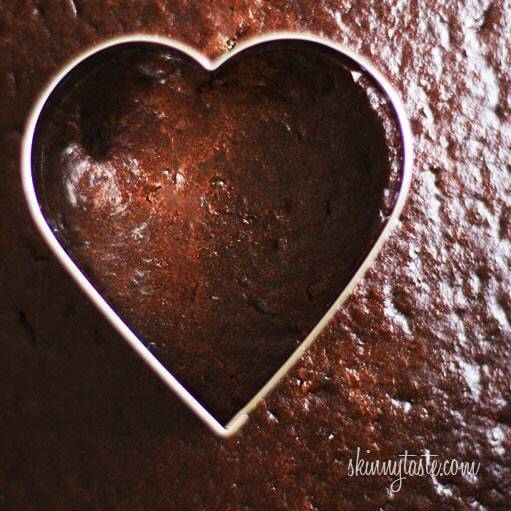 I made this in a 13 x 9-inch pan and used a heart cookie cutter to cut out hearts, but you can make this into 24 cupcakes, a bundt cake or 2 rounds. Hope you enjoy! 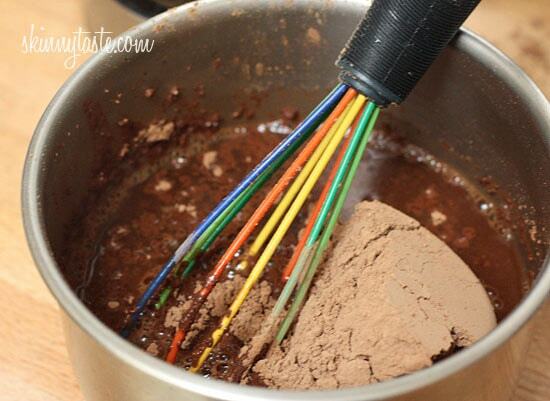 Lightly spray and flour your cake pan. 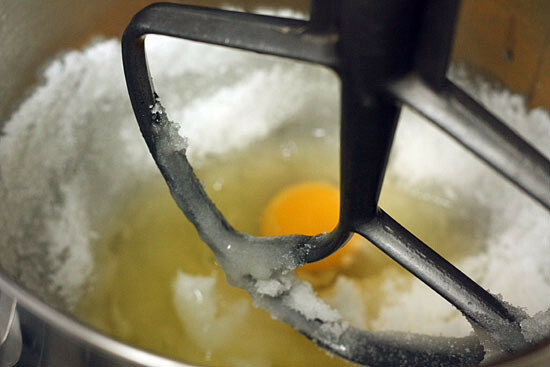 In a stand mixer on low speed combine the sugar and oil; mix to combine well. Add the applesauce until mixed through. Then add eggs and egg whites until incorporated. Last step is to add the Greek yogurt and just stir to combine. Pour into the cake pan and transfer to oven. 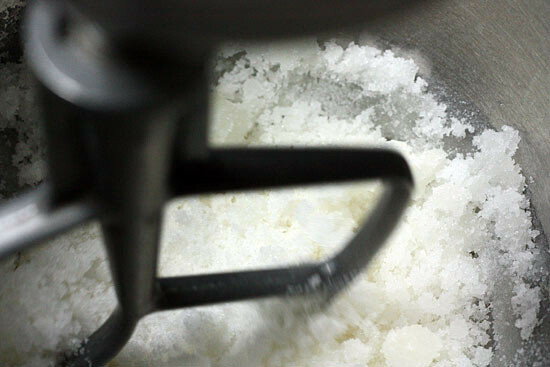 Depending on the pan you use, (I used a 13 x 9-inch pan) bake for 40 minutes or until toothpick inserted comes out clean. Cupcakes will be closer to 25-30 minutes. recipes, and I’ve been married and cooking for 52 years! Thank You. Oh wow. I loved it! I only had 2 eggs but a lot of apple sauce, so I substituted the whole egg with a 1/4 cup of apple sauce, plus the additional apple sauce. Came out great!! I poured some heavy whipping cream over my piece and it was so good. I won’t do it every time, but as a teenager we made a German black forest cake in German class and I remember using heavy whipping cream. This cake is really good! My kids love it! 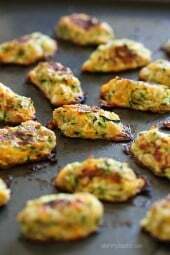 Do you have a cookbook for sale that includes the Weight Watcher points? 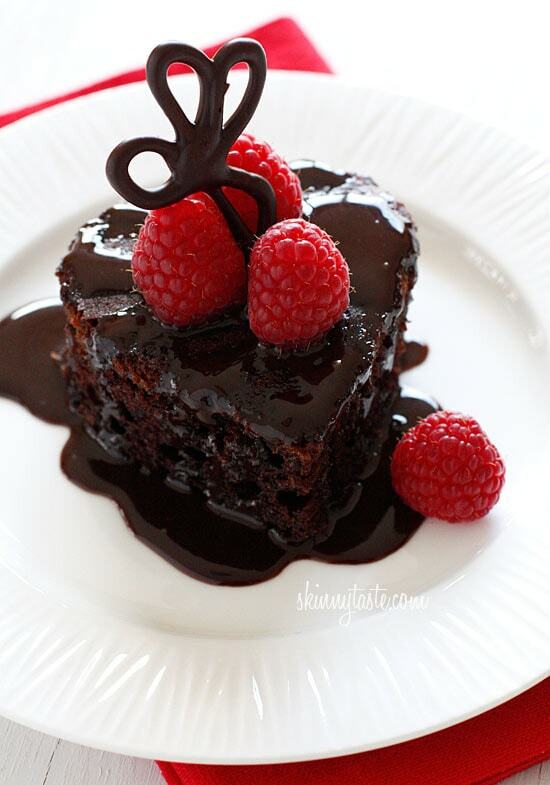 This is so perfect with the chocolate syrup and raspberries as suggested! I made two rounds, and I sliced each round into 10 slices to keep the same serving size and nutritional info. 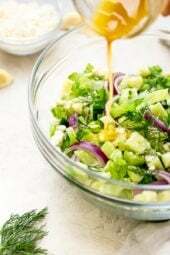 I recognize this recipe; i got the same one out of my mom’s very old cookbook,so it must be a pretty old one.–not kidding, but its very good.–mine’s only a little different. This cake is so sinful, I can’t believe I can have this on WW! Love it! Has anyone tried making this without the cocoa powder and coffee so that it’s just a vanilla cake? Does the type of coffee matter? I have the Giant Foods (or Stop & Sho in other areas) Colombian that is Arabica and Dunkin Donuts Hazelnut blend. Both are k cups. I have Cracker Barrel regular coffee. I also have Giant Foods instant coffee. Id like to make homemade vanilla frosting on this cake. What do you suggest? I saw a few people have asked about the size of the pudding packet in grams, for those of us that live overseas – but I can't find a reply. Can anyone answer this for me? Hi, I live in Singapore and we only get sweetened apple sauce here (these are the brands https://www.coldstorage.com.sg/onlineshopping/browse-brand.aspx?Search=apple%20sauce ) , could you recommend how much sugar I should remove from the recipe? What type of pudding mix should I use? I live in the UK, and I'm not sure which one to buy! Coffee is against my religious preferences (as is tea) is there anything I can do in place of the coffee?? Trying to make this gluten free. Any substitution for the pudding mix? I made this cake as a birthday cake for my husband and he loved it! I did two 9" rounds and stacked them. For the cake I substituted part whole wheat and part all purpose flour with added cornstarch in place of the cake flour. I also substituted Truvia baking blend for half of the sugar. For frosting I used fat free cool whip and mixed in another box of jello pudding mix as well as some sugar free chocolate syrup and cocoa powder, it ended up making a super chocolatey partner for the cake. I also put a portion of the cake in the freezer to eat at a later date. That later date ended up being just four days after his birthday. It defrosted great in the microwave, he didn't want to wait for it to thaw! He is already looking forward to another occasion for me to make this cake. 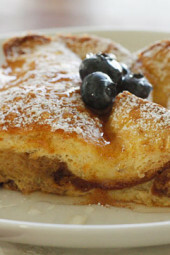 Thank you for the fantastic recipe Gina! This cake has become a household favorite for birthdays and all other holidays. I've made extra and frozen (cupcakes) for a few days and they defrosted wonderfully. Would a cake freeze well for a couple of months? I made this tonight and it was so good. I used Dark chocolate powder instead of regular cocoa powder, and used King Arthur's gluten free flour mix and it came out great. Even when I had to take out out of the oven for a couple minutes when it overspilled and we had to clean the oven, after i put it back it still rose beautifully. Ok, I'm starting to become addicted to your blog. Seriously, I have made several things now and they have all been so good. I made this cake tonight and it.was.amazing. I even forgot the pudding part and it turned out awesome. I couldn't believe how moist it was. I actually cheated a little and used your icing recipe from the snowman cupcakes and drizzled it all over. Thanks so much for sharing your delicious recipes!!! I will be making this again and again! 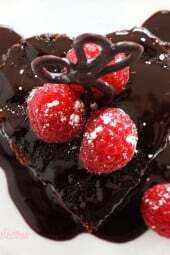 I made this chocolate cake for Valentine's day and it is THE BEST CHOCOLATE CAKE I'VE EVER HAD!! So moist and yummy! I'm making another 9×13 cake for my little guy's 4th birthday tomorrow AND a batch to make 24 cupcakes for the party the following day. Thank you for such an amazing recipe! I'm a HUUUUUGE FAN! I don't drink coffee, but I do have espresso powder from King Arthur Flour that I use in another chocolate cake recipe that makes the same size cake as this recipe. Would mixing 1 teaspoon of espresso powder with 1 cup of hot water have the same affect? Gina, it's recipes like this that keep me loyal to SkinnyTaste. I've followed several other "big blogs" and eventually unsubscribed. Your recipes are healthier, which I could certainly use more of, made from scratch, which is the only way I cook, and always beautiful. I don't necessarily get along well with cake, mostly because I never seem to made anything more than a brick. I am going to make both of these cakes soon. Mr.Sweet Butter is a big cake man, his preferred dessert and in this, I fail. Here's to another go at it, with confidence. I just made this and it tastes absolutely amazing! Definitely one of the easiest, healthiest and yummiest cakes I've ever made. i wonder if this would work if it was cooked in a silicone muffin tin (heart shaped one) probably….. I will have to try it! 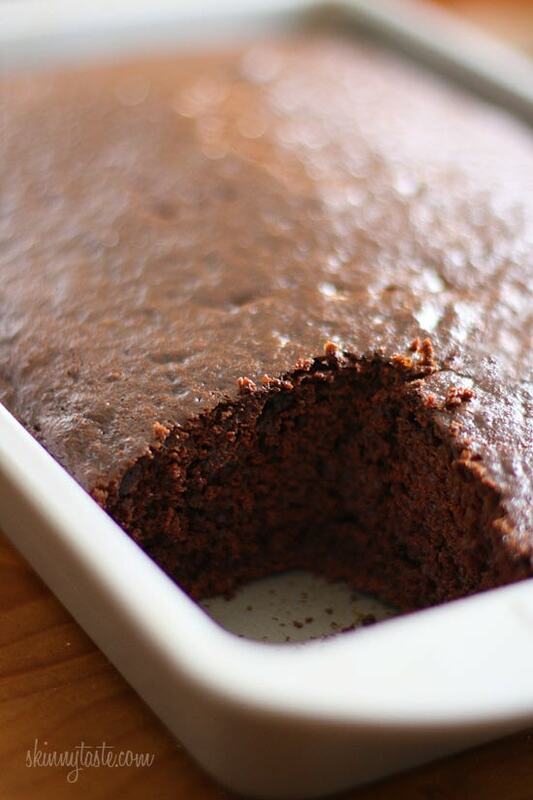 I agree, one of the best chocolate cakes ever, as is very chocolatey and fudgy and so moist!! I made the recipe into 12 very large cupcakes (might do 16 smaller ones next time) and used greased paper liners (as very little oil in this recipe). I did not have instant pudding, so used what I had on hand regular pudding mix (Jello 113 gr. box). I also subbed butter milk for the milk, for extra tang and just used well drained plain yogurt (did not have Greek on hand). Even with these changes the cupcakes were perfect. My husband will be putty in my hands when he tries these!! Great recipe for Valentine's Day. Thank you. Love this website!! OH MY!! Best chocolate cake I've EVER MADE. I made it for my delayed birthday dinner this weekend, and it was SO worth the wait. I had made chocolate lava cake for my birthday and then had to forego it once I calculated fat and calories. This dessert was my triumphant reward. Topped it with fat-free caramel and fresh raspberries….I must confess that I licked the plate when no one was looking – it was that good! Definitely use the hot coffee- I hate coffee but it adds a certain something to the dish that you won't want to miss. Sounds amazing!!!! Can this be made gluten free? If so, what type of gluten free flour would you recommend? Hi. I have been LOVING your recipes. I have spent the last several days looking at them and making menus. Thanks! I am curious, for this recipe, what size package of Instant Pudding should I use? Also, in regards to the coffee debate, I have used hot chocolate in place of coffee for baking recipes and had good success. Delicious! Great recipe! I just made it. To say I hate coffee would be a bit of an understatement, so I was very dubious about putting it in a cake. I decided to bite the bullet in the end – I figured I could just give the cupcakes away to friends, if it came to that – but to my surprise, I cannot taste even a hint of coffee in there. The cupcakes are awesome, some of the best I've ever had! Thanks Gina!! Would using de-caf coffee still give the flavor boost? Gina I found your blog a while ago. Everything I've made so far has been great! Two questions: Can I use the non instant pudding mix? How many grams are there in the small packet? I made this last night for my mom's birthday cake! UN-BE-LIEVABLE!!!!! Seriously! I'm so impressed with this and my family was drooling for more! I had a container of betty crocker vanilla frosting laying around, so i iced the whole outside with that, but used two round cakes, and melted chocolate frosting in between the layers. It is to-die for. Honestly, THANK YOU! This one's definitely a keeper! Does anyone know…would this make enough cake for 2 9 x 2.5 inch round pans? I'd like to make my first round frosted "pretty" cake and I am a bit clueless. Do you use the large or small box of pudding? Made this for my mother in law's birthday. She and her twin LOVED it! I made a fluffy cream cheese frosting to put on top. Soooo good! Thanks for the awesome recipes! Can anyone please tell me how much weights a small pudding package? I'm making these as cupcakes for my son's 3rd birthday party can I omit the Coffee? Or use hot water instead? Yes but the coffee only intensifies the chocolate flavor. No coffee flavor at all. Water adds no flavor. i am secretly making this for my husband for fathers day the secret is more that it is healthier :}. he likes german choclate frosting is there a healthier way less fat sugars etc to make that ? This is the lightest, fluffiest cake I've ever made – mine are usually really heavy and unrisen! 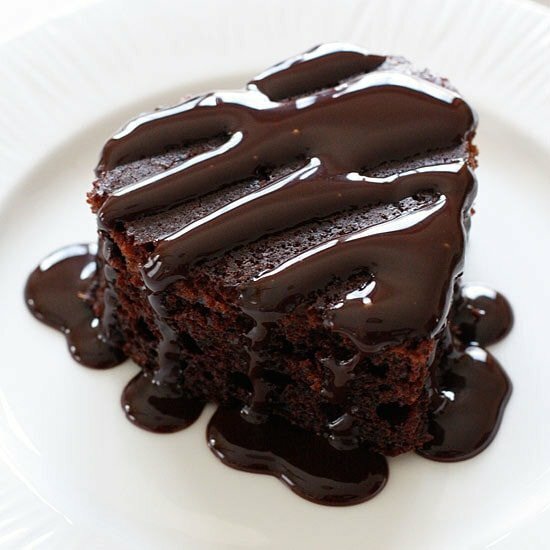 Just eaten a piece drizzled with (skinny) dulche de leche – ok so I know that takes away from the skinny status somewhat but it was a good combination! Great recipe, thanks! This recipe looks so good. 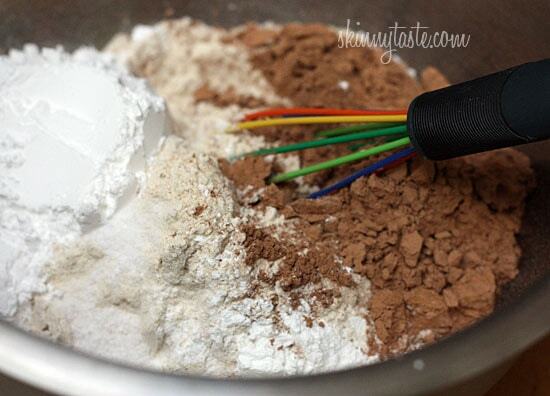 What kind of gluten free flour would you recommend to replace the cake flour?